The white tailed spider has been found in Australia for many years. The spider is easily identified by its elongated shape (1-2.5cm body length), cylindrical lemon pip shaped abdomen and is velvety black with dirty white markings at the top of the abdomen and on the tip of the tail. The legs are glossy with a dark reddish tint. Male spiders have striped legs. There are about a dozen Australian species in the genus. This common spider when found indoors, inhabits wardrobes, clothes left on the floor, bedclothes, bathrooms, laundries and behind curtains. It is normally nomadic, living in the garden under rocks, ground litter and other foliage and most active at night, living off small insects and spiders. Their nomadic nature leads them into homes where they are most commonly found during Spring to late Autumn. White tailed spiders aren’t web bound and catch their prey by predation. Being hunters, they are swift moving and scurry away when disturbed. White tailed spiders only bite if provoked and are not normally aggressive to humans. The symptoms of the spider bite vary according to specific reactions, normally causing a localised burning, stinging feeling followed by a variable illness. Symptoms may include an itchy lump, swelling, blistering, ulceration, nausea or vomiting. Occasionally the bacteria on the fangs of the spider may cause infection or other specific allergic reactions. The spider is suspected of causing skin necrosis, (the decomposition of flesh) in 14 spider bites over the past 10 years. However, until recently, none of the victims could positively identify what bit them. Common sense in the home is the best way to avoid spider bites. Be able to correctly identify the white tailed spider and be aware of the places they like to hide. Because the spiders are more active at night, do not leave clothes on the floor and shake them before putting them on. Check bed clothes before retiring for the night. Spiders can easily be removed into a glass jar and placed outside or sprayed with an insecticide for spider control. If bitten by a white tailed spider the wound should be washed with disinfectant, and if painful an ice pack or anaesthetic cream applied. Try to find and keep the spider responsible for the bite for future identification. Seek medical attention should the patient not improve in 2-3 hours. Understanding spiders makes it easier to recognise their important role in the environment. Considering their natural services also helps to realise they cause little harm and this reduces the need for fear. There are many hundreds of species in Australia and such an emphasis has been put on spiders being poisonous, we often forget that very few spiders are actually harmful. They do not spread disease, nor do they plunder our food supplies. The truth is, spiders are very beneficial and feed on a lot of pest insects we would otherwise have to contend with. It is estimated that the weight of insects eaten annually by spiders outweighs the total weight of the entire human population. As we know, spiders are not insects but are in the class Arachnida. They have only two body parts, the cephalothorax and the abdomen, and eight legs instead of six. All spiders spin silk, but not all build webs for the purpose of catching prey. Spiders such as the common wolf spider run down their prey as would a wolf, whilst a trapdoor spider will lay in wait in its burrow until some prey happens past. In Western Australia, the only spider proven to be lethal is the red-back spider. There has been an effective antivenene for this spider since 1956 and there have been no deaths from a red-back spider bite in Australia since 1955. We also have many species of the large trapdoor spiders and, although venomous, none of these are considered life threatening. We do not have the deadly funnel-web spider in this state. 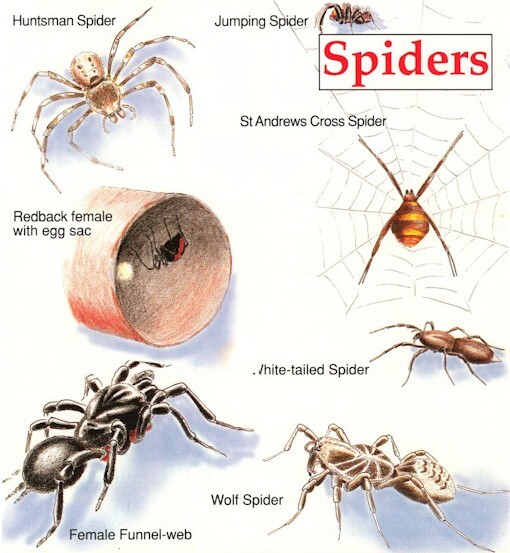 Here is some information on our most notorious local spiders. 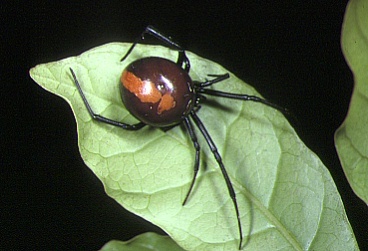 Red-back spiders (Lactrodectus hasselti) are common and found throughout Australia. They are seen mostly in disturbed areas and seem to like living near humans. They nest in dry, sheltered areas where they build messy tangled webs with sticky tracer leads going to the ground that “crackle” if you run a stick through them. The female is easily identified with her long delicate front legs and a red or orange stripe on her pea-shaped abdomen. She also has a red or orange hourglass shape on her underside. Only the female is considered dangerous but is generally a timid spider, biting only in defence or when disturbed. The male is very small, and his fangs are unable to penetrate human skin. Very often the male will be taken by the female as a meal during mating. Our red-back is the same spider as the black widow of north America. Although red-back spider bites are usually immediately painful, the venom (which contains neurotoxins) works very slowly. Bites can result in headache, nausea, vomiting, abdominal pain, fever, hypertension and, in severe cases, paralysis. Untreated, the symptoms worsen over a 24-hour period and may take weeks or months to heal. Red-back spider bites are the commonest poisonous bites requiring treatment in Australia, particularly over the summer months.The female red-back usually hangs upside down in her web.